On January 22nd, 2015, the Program on Negotiation was pleased to welcome back William Ury to Harvard Law School. 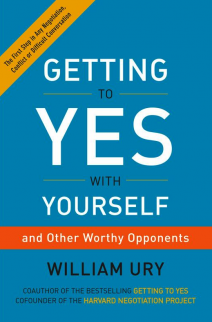 At the Program on Negotiation at Harvard Law School, William Ury, a founding member of the Program on Negotiation and co-author of the seminal book Getting to Yes, spoke about his latest book, Getting to Yes with Yourself (and Other Worthy Opponents). Over 250 community members, students, and faculty members filled Austin Hall to hear Ury speak about the negotiations that need to happen with oneself before going to the table to negotiate with others. Ury is a well-known and highly regarded negotiator and mediator. His work has previously focused primarily on external negotiations, and he has often highlighted the need to “go to the balcony” during these negotiations. This moment of removed reflection is meant to help individuals understand their feelings and motivations, and ponder the feelings and motivations of those with whom they are negotiating. In Getting to Yes with Yourself, Ury highlights the importance of “going to the balcony” with oneself. By taking time to focus on our feelings and motivations prior to entering a negotiation, we can better understand what drives us during interpersonal negotiations. This, in turn, can lead to healthier relationships, in and out of the office. Ury highlighted this practice through several compelling anecdotes. The most riveting accounting Ury shared was of his time spent with Venezuelan President Huge Chavez. About a decade ago, former U.S. President Jimmy Carter requested that Ury assists in the peace process in Venezuela, as international audiences feared a growing and sustained conflict in South America. Ury agreed and met with Chavez and his entire cabinet around midnight one night. Chavez asked for Ury’s view on the current situation, which Ury shared. Yet Ury’s response did not please Chavez. The President angrily replied to Ury in a 30-minute tirade, during which time Ury was somehow able to go to his mental “balcony.” He appraised the situation, the moment he was in, and his own interests. Once he saw Chavez relax and finally open back up to the conversation, Ury offered a suggestion that satisfied Chavez and led to ongoing peace talks. Ury’s many incredible experiences in the field supplied him with copious amounts of information on how an individual can make their negotiations more productive and successful. He codified these experiences into six steps that any person can use to get to yes with himself or herself. These included developing an inner BATNA (Best Alternative to a Negotiated Agreement) and reframing the situation one is in. His talk was met with resounding applause and was followed by a lively Q&A session. “Getting to Yes with Yourself: A Book Talk with William Ury” was part of the Program on Negotiation author lecture series. These talks give community members and other affiliates the chance to learn about new research in the field as it is published. PON affiliates frequently publish on a variety of subjects related to the fields of negotiation, mediation, and alternative dispute resolution. Previous authors who have spoken at PON include Max Bazerman on The Power of Noticing, Doug Stone and Sheila Heen on Thanks for the Feedback, and Erica Fox on Winning from Within. What do you think about Ury’s book talks on “Getting to Yes with Yourself”? Leave your thoughts in the comments section below. For upcoming author lectures and our other public events, please visit www.pon.harvard.edu/events. The Program on Negotiation is a consortium program of Harvard, MIT, and Tufts. PON was formed in 1983 by a group of practitioners and professors, with the aim of advancing the theoretical and practical aspects of negotiation and mediation. PON currently supports numerous scholarly projects, provides teaching materials through its Teaching Negotiation Resource Center, and inspires and informs hundreds of lawyers and executives through executive education training throughout the year.